Tale as New as Time… | Lord...What's My Motivation? « No Child Left Behind? Well, how’d they get behind to begin with!? The cast of “BEAUTY and the BEAST” take a break after re-learning the song HUMAN AGAIN. We began as a small group of young people anxious to offer the wildest take on one of the most “known” musicals out there. It started late February last year, and I was at my final callback for “Beauty and the Beast.” I was very nervous (of course)…but a bit uncomfortable as well. I have been called back for Beast and Gaston. And the young lady I continued to read with (as Beast) for Belle, was the wife of the guy I was in competition with for Gaston. (Got that?) Talk about awkward. I left there thinking…”Sheesh! Even if I get the role…how is this thing going to pan out!” Well, I got Gaston and the cast was amazing. The varied approaches and disciplines were an inspiration, the creative team including very gifted director challenged me, and the final product was one of the most widely attended musicals in Super Summer Theatre’s history. A success by many people’s definition. Fast forward to last week, the first full week of “second round” rehearsals. We have a new Maurice, a new Cogsworth…and to be honest we’re still looking for a Mrs. Potts! There is also a handful of new chorus members, all of which have helped this ensemble flesh out to be a rather exciting one. I’m thrilled to say that Evan Litt who played LaFou to my Gaston (and is amazing!) will be returning. He originally didn’t think he could come back! I’m thrilled. We’re a little bigger, a little bulkier…and it’s going to be a BIG, HUGE show. 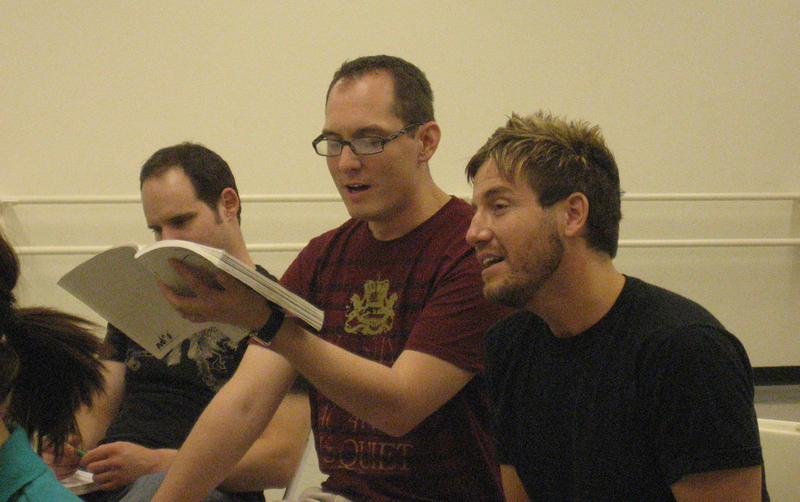 I run through the song “GASTON” with Evan Litt during vocal rehearsal. One of the most exciting things about last week was the fact that our director Phil Shelburne, told us to drop our preconceived notions and approaches to the characters. “This is a new show, with new goals, and new approaches,” he said. But as our first read-thru indicated, that wasn’t going to be easy. Everyone (who was in the original cast, anyway) slipped right into the same routine. At break, Phil pulled Kari (who plays Belle), Sevyn (who plays Beast) and myself aside to ask us to really work hard on breaking down these characters to the bare minimum, so that we can rebuild them back up again. After that read-thru, we spent the rest of the week perched at the edge of our seats, going over vocals. 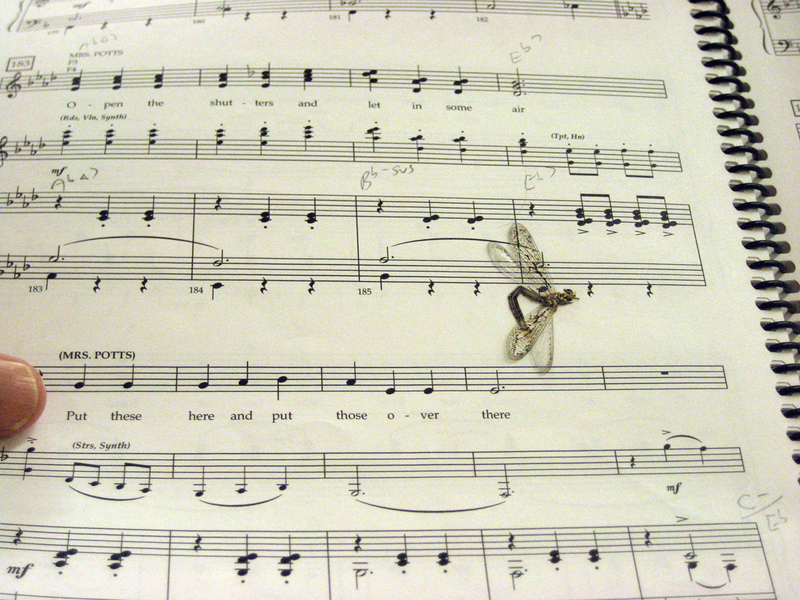 Our vocal director Lisa Fairweather (who’s amazing, by the way) has us relearning everything. Chorus parts I sang tenor last show, I now sing baritone and vice-versa. They are really working hard to make this a NEW show. It’s crazy. We all supported on another and really made the newbies feel like home….we played games…brought up memories from the past…we even stalked and smashed a killer dragon fly who was out of control! So, as I trudge forward this next, very busy week, I will be anxious to see what surprises await me around the corner. One things for sure, it’s not going to be easy. We approached this thinking it was going to be a casual transition back into a comfortable show. Instead, we’re going to take some rude, base “beast-like” notions…go crazy with them over the next two months, and then hopefully transform this puppy into a prince! CLICK HERE FOR BEAUTY AND THE BEAST TICKETS. This entry was posted on September 15, 2008 at 4:58 am and is filed under ACTING ONSTAGE, DIRECTING FOR THE STAGE with tags Beast, Beauty and the Beast, Belle, Community theatre, Disney, Gaston, LaFou, Las Vegas, Mrs. Potts, musical, Signature Productions, theatre. You can follow any responses to this entry through the RSS 2.0 feed. You can skip to the end and leave a response. Pinging is currently not allowed.